There is one particular item on the list of equipment that may be significant for the Coast Guard, “57mm gun (with ALaMO)”. That means the “Advanced Low Cost Munition Ordnance” or ALaMO program to provide guided projectiles for the 57mm Mk110 gun is still on track. Apparently ALaMO uses the same guidance system developed for the Hyper-Velocity Round. The FFG(X) will also share, in common with all the NSCs, the Mk160 Gun Fire Control System, and with the later NSCs, the Mk20 Electro-Optic Sensor System (Mods may be different). This means we can expect continued Navy support of these systems over the long-term. Request for Proposal is to be issued Q4FY2019. Contract award is expected Q4FY2020. I note there is still no image available for Huntington Ingalls proposal which may be based on the National Security Cutter. Below is a list of equipment for the FFG(X) found on page three of the presentation. I can not claim to recognize all the acronyms. Interestingly there is space and weight reservation for a 150 kW Laser Weapon. Project 23550, Ivan Papanin class icebreaking patrol vessel, with towing capability and containerized cruise missiles. The National Interest is reporting that the Russians are planning to use lasers as a way to facilitate icebreaking. 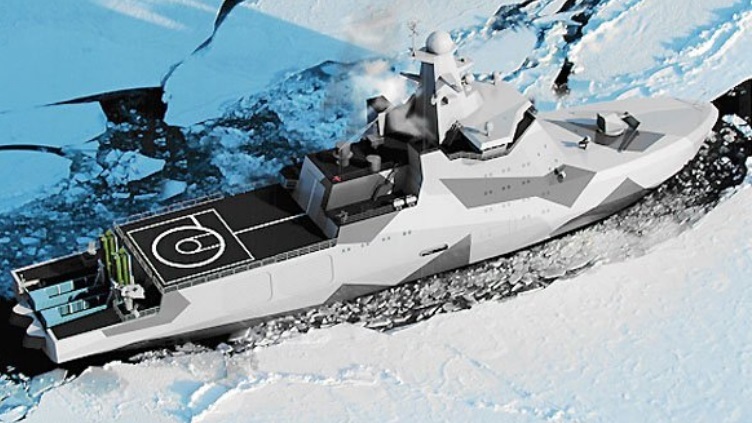 But he refers to the Project 23550 (Ivan Papanin) class icebreaking patrol vessels which we talked about earlier, armed but relatively small (for an icebreaker) and definitely not nuclear powered icebreaking patrol ships with provision for mounting containerized cruise missiles. 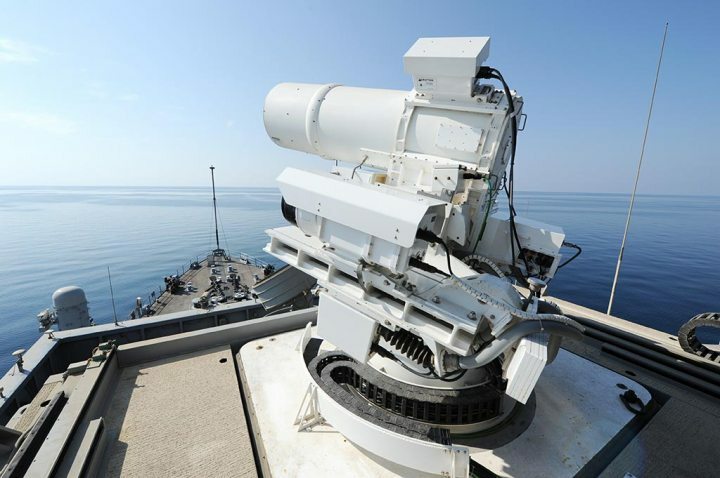 The author seems to have assumed that the laser could also be used as a weapon although the mounting and targeting requirements for a laser weapon would be much different. Despite the author’s apparent confusion, this is the first I have heard of using lasers to facilitate icebreaking. Using one to open a crack in the ice before the bow hits might be worthwhile. Whether it is even feasible ought to be something that could be determined mathematically. Sounds like something worth looking at. 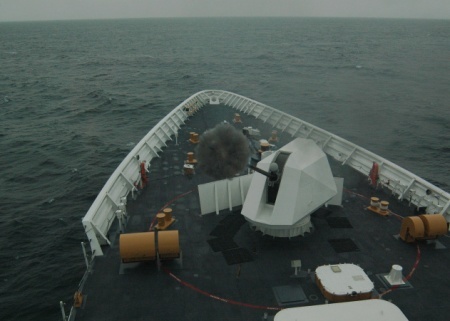 Navy Recognition reports that BAE now offers a 60 kW Laser addition to the Mk38 mod2 gun mount currently on the Webber Class Fast Response Cutters and planned for the Offshore Patrol Cutter. Note the laser on the USS Ponce is only 30 kW. How it might be useful: It could be used in a less than lethal mode. It could probably be used for disabling fire against outboard motors with greater precision than a gun. It could be used to destroy UAS (drones) inside ports without worrying about where misses might land. This Navy Times story is one of several I have seen that report Rep. Duncan Hunter’s (R-CA) displeasure that the Coast Guard is unable to use some of its laser equipment because of FDA regulation. Representative Hunter has done us a favor in bringing attention to the issue, but ultimately I think he will find that the FDA oversight requirement is based in law and Congress will have to change it. That is all very well, but the Coast Guard probably does not have many laser experts who can do that, and we should not trust the word of our contractors. If Representative Hunter wants to introduce a bill to cut some of the read tape, by all means allow the Coast Guard to self certify if they develop the independent expertise to do that, but it would be more immediately useful if there was simply provision for DOD certification of Coast Guard equipment. This should include automatic application of DOD certification to any DOD type Coast Guard equipment used for the purpose for which it was certified. The Laser can be a less than lethal deterrent,. The Coast Guard has recently experience a rash of laser attacks. Fortunately there were apparently no injuries. Don’t know what the punishment for pointing a laser at a boat crew is, but it should also be significant. Time to Ditch the 57mm?